I’m a firm believer in passing along books, but I can’t do that in this medium. However, I can tell you about those I really enjoyed in the hopes that you might as well. Also, I think it’s good to give credit to work you enjoy. So, this is the first of an ongoing series. I hope it introduces you to something new, or returns you to something you love already. I found The Dresden Files by Jim Butcher when I stumbled on the short lived TV series, which you can read about here. Since I hadn’t read the books first, I enjoyed the series, though it lasted only one season. (It’s currently available on Netflix). As I understand it, many of the more die-hard fans weren’t happy with the series because it wasn’t “true” to the novels, but no television series will be. Even Game of Thrones, which spreads each book over an entire season, diverges from the books in a number of ways. The series is wonderful, and possibly one of my favorites. In the spirit of full disclosure, I’ve “read” only one of the books, Side Jobs. All the others I’ve listened to on audio book, and they are awesome! James Marsters is an incredible voice actor, and actor in general. I’d say his performance had a lot to do with why I love this series so much; he doesn’t just read, he embodies the character. However, he doesn’t read the thirteenth book, Ghost Story, and while the actor does a fine job, it just wasn’t the same to me. The protagonist is Harry Dresden, “the only openly practicing professional wizard in Chicago,” he’s even in the phone book. Harry also has the aid of a spirit of intellect, who happens to live in a skull, and is named Bob. Bob is the best comic relief I’ve ever read. He’s a lecherous incorporeal spirit with a fondness for bodice ripper romance novels, but is also sarcastic, witty, and a perfect foil to Harry. Harry, is an old fashioned gentleman, opening doors, coming to a lady’s defense. Bob, however, on more than one occasion possesses someone and turns a sorority party into something Caligula would admire. 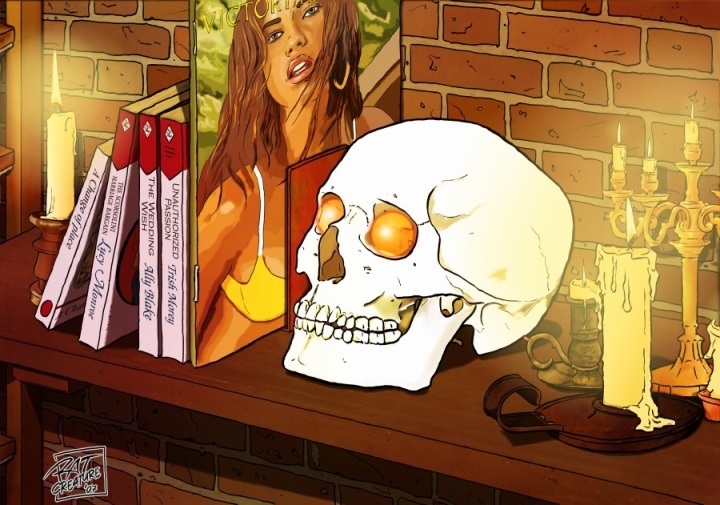 He also has great lines; one that I keep coming back to is: “What you know about women, I could juggle.” The other characters also step off the page. Actually, they leap off and do a rather impressive song and dance routine. I’m also impressed by the detail with which Mr. Butcher has created his world and its mythos. 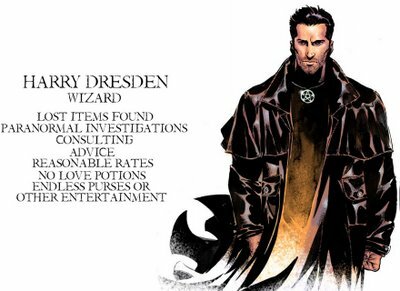 If you like fantasy and/or urban fantasy, I think you’ll enjoy The Dresden Files. If you like audiobooks, I can’t recommend it enough. I’ve listened to them all at least twice, some three times, and I’m anxiously awaiting the next release. The series is entertaining, exciting, hilarious, and an excellent escape. It might just have you wanting to make a trip to Chicago to look for his office. If you find it, let me know! This entry was posted in Good Reads and tagged Dresden Files, Good Reads, Harry Dresden by bishopoconnell. Bookmark the permalink.